A Peterborough man who twice risked his life and those of other rail and road users at a level crossing has been jailed for six months and banned from driving for two years. Ian Wright, (45), of Hedgelands in Werrington, Peterborough, was sentenced at Peterborough Crown Court on Monday, 22 February, after pleading guilty to two counts of Dangerous Driving at an earlier hearing. 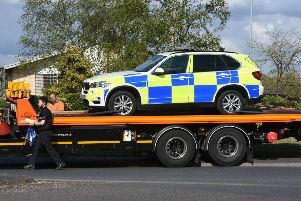 The court heard PC Sean White of British Transport Police, witnessed Wright’s reckless behaviour at Helpston level crossing at 8.30am on Friday, June 13 2014. PC White, who was monitoring the crossing at the time, heard Wright revving his engine before overtaking a line of stationary cars, the court was told. Despite the fact the barriers were down and the red lights were flashing, Wright then proceeded to weave his way over the crossing at speed. While PC White was unable to follow Wright, the signalman at the crossing managed to write down his number plate. PC White traced Wright who had already received a Notice of Intended Prosecution following an incident at the same crossing a month earlier. The court was told that on Tuesday, May 13, a BTP officer had seen Wright overtaking a line of cars on the wrong side of the road. A driver at the front of the queue sounded his horn, but, the court heard, Wright ignored the warning, jumping the lights, before driving over the crossing. Speaking after the sentencing, PC White said: “Wright’s reckless actions endangered the safety of both himself and other rail and road users. “Level crossings are dangerous places, and we take deliberate misuse very seriously.